Bootleg and unofficial programs and promotional programs and score cards have more than likely been around since the balloon race of June 1909, but the first example we're aware of is the “Who They Are” promotional program (booklet) from1911. It is identical to that which appears in the 1911 program with the only difference being it is smaller. 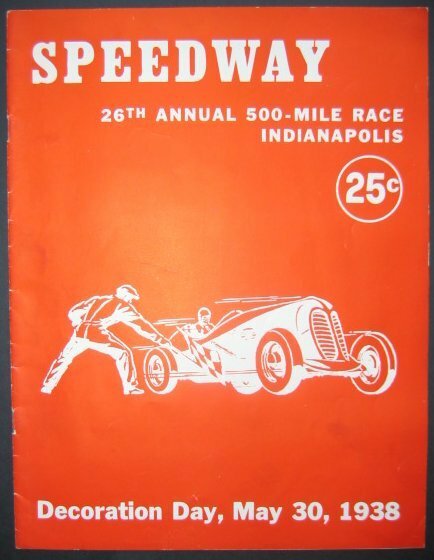 Couple the Indianapolis Motor Speedway with the motivation to make a profit or promote yourself or business and you've got the recipe for a bootleg and unofficial programs or promotional programs and score cards. The Speedway did try to thwart bootleggers in 1919 when car numbers were not assigned until race day, but it barely made a dent as the bootleggers continued making programs as seen with the 1921 and those of subsequent years. They come in all shapes, sizes and designs from the narrow 1916 Records of Entrants pamphlet, the digest size of 1930 and 1934 to the original program size of the 1968. Those done for profit will have a price for purchase such as the 1913 with the 1911 official program cover reproduced on the front and an ad for Hitzelberger's chicken dinners at the bottom. This program and the 1915 from the Monon Railroad tie in both profit and promotion. The latest known with a price on it is the 1985. 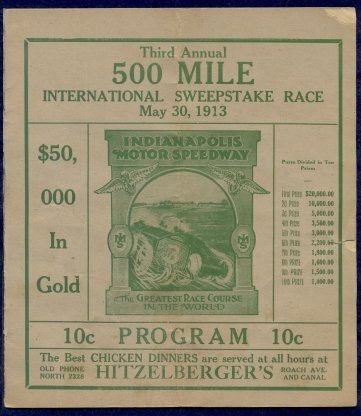 The 1913 Hitzelberger's also has scoring pages, an entry list and ads so it is more like an official program where as most had just a few pages with some advertising and/or pictures and may have little or no information save for an entrant and/or score chart. Other substantial programs are the 1968 which has forty six pages (counting front & back) with only the articles and pictures but no advertising from the actual 1968 program and the 1985 which is about a 1/4 that of the actual program in both size and content. Note the 1915 with the 1911 program cover reproduced on the front is very similar to the 1913 Hitzelberger's except there is no ad at the bottom. Promotional programs and score cards were probably given away such as the 1912 (promoting McKernan's Men’s Clothing Store of Indianapolis inside) at top left below or the Burd Piston Rings score card from 1941 at bottom left. Note that the 1912 McKernan's and the 1913 featuring Bob Burman spell program as "Programme" which is commonly seen on foreign programs. It’s possible these could’ve been sold even though no price is on the cover. Most are a few pages with some advertising and/or pictures and may have little or no information save for an entrant and/or score chart like that of the 1928 Veedol lap time chart or the Burd Piston Rings score card from 1941 below. The 1916 Records of Entrants, which also has a Summary of 1915 Speedway Performances, is one of the more substantial as to contents than most. The 1985 may be the last program/score card of this type known but there may be others from recent years. However, with the cost of materials to make this type of program/score card of any quality and/or quantity becoming more expensive and copyright laws more stringent, it is more or less a wasted effort today. As to values or rarity, it is assumed this type of program/score card were made in far less quantity than official programs which would make them more scarce or rare. However, while they may be more scarce or rare than official programs, the demand for official programs is more than for this type of program/score card so this must be taken into account when determining a value. The 1941 Burd Piston Ring score card is probably the most common of this type of program/score card and are relatively inexpensive.